Rock Solid Recrap: Who's Left? Dan Haren did what Dan Haren does best... pitch a baseball. He made it look way too easy. By my count the Rockies only hit the ball hard twice. Carlos Gonzalez led off the first with a clothesline HR to straight away center. In the 8th, Eric Young Jr. tagged a double to right. I mean he really tagged it. I'm impressed with what I'm seeing from him since his recall. It's Dante Bichette Night at Coors Field! Let's win one for Dante! Or just win one because winning is better than losing! Hey look... that's Larry Walker! Nice surprise for all the folks out at the ballpark tonight. Rockies go with the same lineup as yesterday. No arguments there. Arizona will have Justin Upton despite his fouling a ball off his leg last night. Dammit. The Diamondbacks outsmarted the entire baseball world when they brought in Kelly Johnson to play second base. Dude has 7 HRs already and is hitting .322 at the top of their order, and he really could have been had by anybody for next to nothing after a brutal 2009 in Atlanta. The D-Backs had the foresight to make the move knowing a bounce back was very likely. Of course I don't think they saw this type of bounce back (he's already halfway to career high in HR) but it was a low-risk/high-reward move that's paying off. If only they could have made a signing in the bullpen that made the same impact for them. 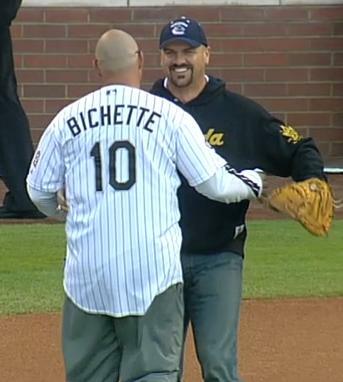 There's no doubt Dante Bichette was the Rockies original Rock Star. The electricity in the ballpark every time Sledgehammer played was off the charts. I know that's one of the things that drew me to Dante, along with his flare for the dramatics and his unusual batting stance that I attempted to emulate throughout with Little League and high school career. With far less success I might add. Thankfully my mom never let me grow the mullet, but I always had the batting stance. It'll be nice to see Dante at the ballpark tonight. His walk-off homer in that first Coors Field game is one of my favorite baseball moments. I'll always remember watching that game on ESPN (one of the few I got watch back in those days) and just being pumped beyond pumped that they won. Thanks for that memory Dante... and welcome home.